February | 2013 | And Baby B Makes Three! *Shoes. Ohmygoodness this girl loves shoes. Which is funny, because the first time we went to buy her real shoes after she could walk, she was crying her little head off because she hated them so much. Funny how some things change. We actually have just one pair of shoes for her (confession?? ), but she loves them. It’s often the first word she says when she wakes up in the morning, and she often indicates very clearly to us that she wants to take OFF her footed pajamas so she can put on her shoes, even before she’s had her diaper changed or eaten breakfast. But it’s not enough to have on her shoes. She then wants to take off her shoes. Why? Solely so she can put them on again — no joke. She retrieves our shoes, often from other rooms, and offers them to us, even if we’re currently wearing shoes. She likes to return all shoes — hers and ours — to their rightful spot when they’re not being worn. Girlfriend loves her shoes, much like The Big Sis did as well. *Babies. This obsession started about six months ago, over Labor Day weekend, when we found The Big Sis’ first baby doll at my parents’ house and brought it home. The Little Sis took immediate possession of it (and thankfully The Big Sis was agreeable to this), and she hasn’t looked back since. I’d say it’s somewhat of a comfort item for her, at least at bedtime and occasionally around the house; we don’t usually take it with us if we leave the house. This baby doll is named Ashley, and she also got another baby doll for her first birthday that we call Soft Baby. (Creative, no?) She has some other baby dolls as well, but these are her two favorites by far; when she starts calling out for “baby! baby! baby!” these are the ones she is requesting. She also loves to look at pictures of babies in books. The other day, I made the video camera on my phone forward-facing, so The Little Sis was staring at herself on the screen while it recorded, and she was quite entertained by herself. Then, I played it back for her, and she was so funny reacting to the “baby” on screen. I’d ask, “Who’s that?” and she’d declare confidently: “BABY!” in between cracking up at herself. *Juice. The Little Sis does not get “juish” — ever — at home or at daycare. Yet she uses the word generically to convey a desire for her cup that contains either milk or water. For some reason, I can’t let this go and feel the need to correct her every single time she asks for her “juish.” “You mean your milk? Yes, here it is.” But anyway, she’s obsessed with her “juish”-that’s-not-really-juice. *The Big Sis. The Little Sis has long thought that The Big Sis hung the moon, but this sister worship has really kicked into high gear of late. If The Big Sis is not within view, The Little Sis will call out her name in question to ask where she is. She loves playing in her crib with The Big Sis. She loves reading books with the Big Sis. I could go on, but you get the idea. Another obsession to add to the list. It was a week late thanks to her bout with RSV last week, but The Little Sis and I ventured to The Pediatrician this morning for her 18-month checkup. Nothing really big to report from the check-up; she looks nice and healthy and the doctor has no concerns. We didn’t have the usual developmental questions to answer but instead had to fill out the 18-month M-CHAT autism screening (no concerns there at this juncture). She had one shot (DTaP), which made her cry for less than a minute and then she was fine and we went on our merry way. Next check-up will be at 2 years. Wait, what? Two years?! 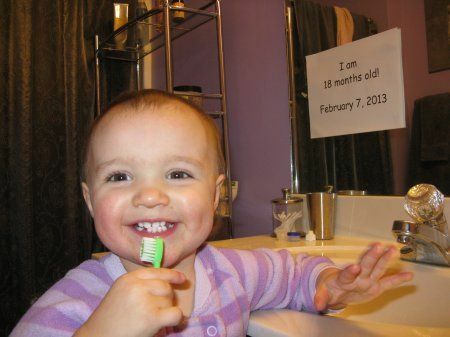 Well, this is a bit late, but here is The Little Sis’ 18-month pic from last week. She’s getting to be such a big girl! She definitely wasn’t improving by Monday; in fact, when she woke up, she was breathing fast (though not labored) and her lips had a purple-ish tinge to them — not good. We’ve had plenty of experience with RSV before (The Little Sis had it last year, and I lost count of how many times The Big Sis had it), so I got The Big Sis’ ProAir inhaler and we gave her some puffs of that, hoping to help her breathing. It did seem to have an effect, and her lips returned to normal color pretty quickly (whew! ), but I still called The Pediatrician mid-morning and asked to be seen again, and we were in the office around noon. Poor thing was just so out of it — clingy, sad/tired eyes, lethargic — just not herself at ALL. The Pediatrician (our usual one this time) agreed that it sounded like RSV and did a test, and I was not that surprised that it came back positive. Unfortunately there’s nothing to do to treat the virus; we just had to manage the symptoms. On Tuesday morning, The Little Sis woke up without a fever and was acting quite a bit more normal that morning but around 4 o’clock that afternoon, she was struck again and her fever returned, this time in the 103 range. Ugh. And here is where I mention that this was not the most convenient week for her to be sick. I suppose it’s not ever really convenient, but I had multiple deadlines this week for one of our busiest issues of the year, so on top of caring for her most of each day, I had to work some late nights and early mornings to get my work done. I’m ready for Friday! And it’s a long weekend, at that — it’s the first time I’ve ever had Presidents’ Day off! Anyway, the last time she had medicine or a fever was on Tuesday night, and Wednesday was a more normal day for her. She was still fussy and clingy, but not feverish and lethargic as before. In an ideal world, I would have kept her home again today (Thursday) to let some of her chest congestion clear up, but as all working moms know, sometimes that’s just not possible and we have to send a less-than-healthy child to daycare. Sigh. (At least she shouldn’t be contagious with the fever gone 24+ hours.) She had a hard time with me leaving her at daycare this morning. Her teacher had to hold her and give her a hug and she just cried and cried as I walked out the door. Ouch. Before I shut the door, I told her teacher that she would probably be fine once I left, since she was acting mostly like herself this morning, but that she could give me a call if she just didn’t seem like herself. It’s almost pick-up time, so it looks like she made it through the entire day, and I’m eager to give my sweet girl a big hug on this Valentine’s Day. I was talking recently with one of the group leaders at The Big Sis’ after-school program. She is not The Big Sis’ leader, but sometimes she’ll sub in her group and I’ve seen her fairly regularly since the beginning of the school year. I try to pick up The Big Sis first (it’s a whole lot easier logistically that way), but when I worked at my last job, it made more sense to pick up The Little Sis first (daycare was two blocks from my office) and then pick up The Big Sis (her after-school program is two blocks from our house). And she is. She truly is. I was a little thrown off by the question. “Pardon me? Where did you hear that?” I inquired. I thought maybe one of her friends had said it. She told me that her after-school group leader said that another girl in her group doesn’t share well because she’s an only child. “She needs to have a sibling,” is what The Big Sis told me The After-School Leader declared to the class. I will admit: I DO know plenty of only children who are kind of spoiled, bratty, and float through life with an “all about ME!” attitude. But you know what? I know plenty of only children who are NOT like that. As well as quite a number of adults who act spoiled, bratty, and me-me-me yet they do have siblings. I think birth order does shape a lot of who we are, but I don’t think it’s the ONLY factor in determining such things as how well we share. Overall it was good, though, because The Big Sis asked why not everyone has a sibling, which we’ve talked about before, mostly when she was asking for a sister and we weren’t successful, but I’m sure she doesn’t remember. So I told her how some parents don’t want any more kids — and some don’t want any in the first place — and some parents want more but can’t, for a variety of reasons. And that we don’t really get to decide how big our family is, but that families come in all sizes and that’s what makes the world so cool. So it was a good chance for me to remind The Big Sis of all that stuff. Because if you think about it, I’m raising one of our future’s thinkers. So if current adult generations can’t get this concept through their head, then at least I can do my part to make my child understand that each family is unique and should be celebrated. You are currently browsing the And Baby B Makes Three! blog archives for February, 2013.